Vortex Razor HD Gen II 4.5-27x56 Riflescope EBR-1C MRAD Reticle RZR-42704 is high on precision and great as long range optics. It is devised to ensure dialing precision for long range shots in critical conditions and apt for serious precision shooters. 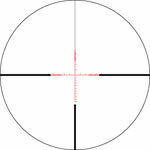 The Vortex Razor HD Gen II reticle available with this scope is EBR-1C ranging reticle with MRAD-based subtension lines. Vortex RZR-42704 comes with 6x zoom range, 34mm single piece aircraft-grade aluminum tube and L-Tec turret system along with a number of high-performance attributes for extreme accuracy. Other features include premium HD lens elements with (High Density) extra-low dispersion glass for High Definition images; XR plus fully multi-coated air-to-glass surfaces for maximum light transmission; Argon gas purging for fogproof performance; O-ring seals for waterproof performance; and ultra-hard, scratch-resistant ArmorTek coating on exterior lenses. The feature-list also consists of APO system, optically indexed lenses, plasma tech application process, 34mm single-piece aircraft-grade aluminum tube, L-Tec turret, first focal plane, fast focus eyepiece, side focus, locking side illumination, hard anodized stealth shadow finish and more. Vortex Razor HD Gen II 4.5-27x56 is in stock at Scopelist.com. Field of View: 25.3' - 4.4' @ 100 yds.